eBay is a household name. Maybe you have heard or seen it mentioned on TV shows, in movies, or on national news. You might feel like you are in the dark about this huge marketplace that is now a part of global culture. So, what is eBay? eBay is a marketplace where millions of people trade every day. Some are buyers; some are sellers, some are both. The beauty of eBay lies in the power of the marketplace - an item is only worth what someone will pay for it. This can mean very high prices for highly sought after items like collectibles, discontinued items, vintage items, unusual items, or anything in short supply. You may recall when the Hostess factories shut down, and Twinkies were temporarily discontinued? Savvy eBay sellers bought them up and sold them on eBay for a premium. Or maybe you remember when the Pie Face Game was selling one Christmas season for around $100 on eBay? It is all about supply and demand. You can get just about anything imaginable on eBay even when the item isn't readily available in a brick an mortar store locally. eBay began as a place for collectors to meet virtually and trade collectibles. Back in September 1995, Pierre Omidyar launched a site called Auction Web, which would evolve to be the eBay we know today. He had no idea that his original concept would explode into something that is now a household word. Collectors love eBay because of the availability of items, advanced search and notification systems, the variety of items, ease of purchase, recourse through eBay and Paypal if the transaction isn't right, and user-friendliness of the site. A collector can spend hours on eBay browsing items, adding them to his watch list, bidding, making offers, or just considering what to buy next. eBay is has proven to be a boon to the environment. Millions of tons of goods that would otherwise go into landfills or more resource-intensive recycling programs instead find new homes every year thanks to eBay. Some of these goods include consumer electronics items like computer parts and mobile phones that release toxic substances once they're discarded and exposed to the environment. Other items like clothing, toys, office supplies, home decor, and textiles find new homes and are kept in circulation rather than dumped in the trash. Sellers often feel a calling to "re-home" unwanted and discarded items as a way to reduce the amount of stuff going into our landfills. Because eBay eliminates middlemen and lowers barriers to buying and selling, potters in rural Mexico and bead weavers in central Asia can sell hand-made goods directly and inexpensively to a massive global audience. This brings new economic opportunities to developing areas and increases cultural understanding between populations. eBay has become one of the world's most interesting and exciting transnational ambassadors. 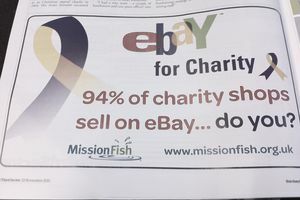 According to eBay's mission statement, "eBay's mission is to provide a global trading platform where practically anyone can trade practically anything." By nearly any measure, eBay has succeeded at its mission beyond its wildest dreams, and it has done so almost entirely in the online universe. But don't take my word for it. Visit ​eBay and explore one of the largest success stories of the Internet. Then join eBay to start shopping for great deals on your favorite items or to start turning your old junk into fresh cash.